Alright my Wildlings! 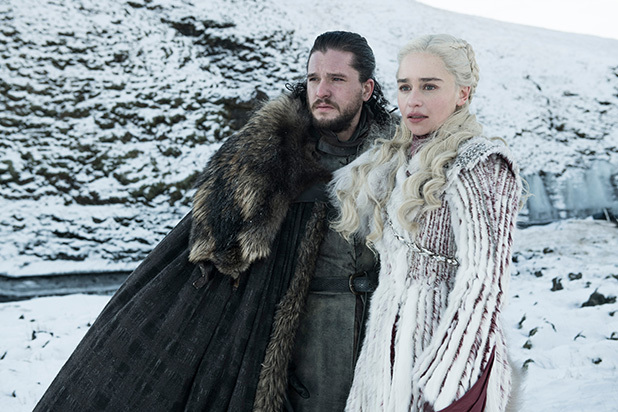 The final season of Game of Thrones is FINALLY here! And while “the North remembers,” it has been a year and a half since the season 7 finale, and there is a LOT of catching up to do! Most of the characters are finally reuniting with their loved ones (or in some cases, their nemeses). Because of this, our premiere recap will be structured around these reunions. And obviously, major spoilers ahead. Because that’s what I do. I drink, and I spoil things. 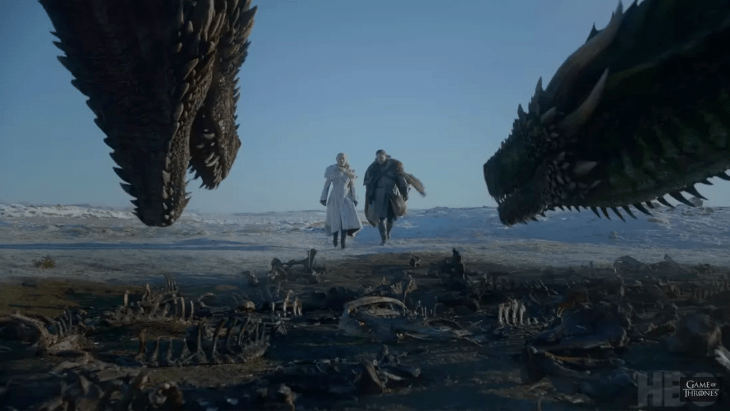 The episode begins with Daenerys and Jon (and her armies and dragons) marching into Winterfell. The northerners have gathered to watch the procession and look none too pleased about their King returning having supplicated to a Targaryen — especially when her dragons swoop in. Jon and Bran reunite. Jon compliments Bran on being all grown up. Bran makes it weird. He also warns Daenerys that the Night King has taken her fallen dragon and used it to destroy the Wall. The Night King’s army is marching for Winterfell. 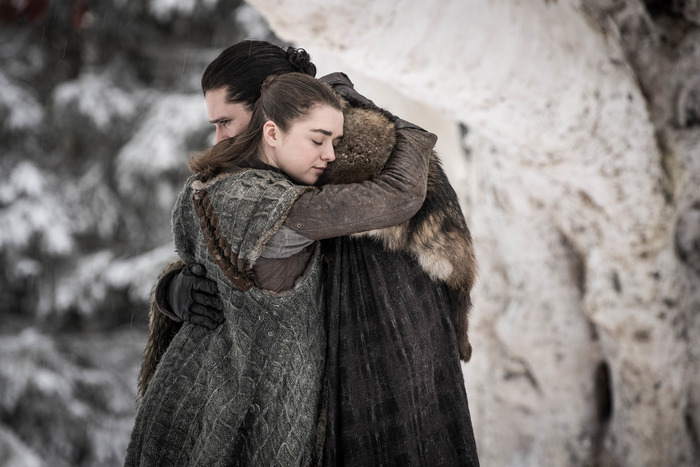 Jon and Sansa embrace. He nervously introduces her to Daenerys, and hooooo boy is Sansa not thrilled to meet her. She is polite, but cold. Sansa is furious with Jon for bending the knee and does not trust Daenerys. Things are tense. Tyrion tries to defend Jon’s choice. He explains that they have brought the greatest armies (the Unsullied and the Dothraki) the world has ever seen AND two full grown dragons. He also tells them that Cersei has promised to send the Lannister army north as well, to help. This does not go over well, especially the Lannister army part. Sansa sharply counters by explaining that Winterfell is not prepared to feed two armies and two dragons and wonders if they will be able to survive the winter. She snarkily asks, “What do dragons even eat?” “Whatever they want,” Dany replies, giving Sansa the side eye. Tyrion approaches Sansa while she watches Gendry unload wagons of dragon glass. They haven’t seen each other since Joffrey’s wedding (all the way back in season four). 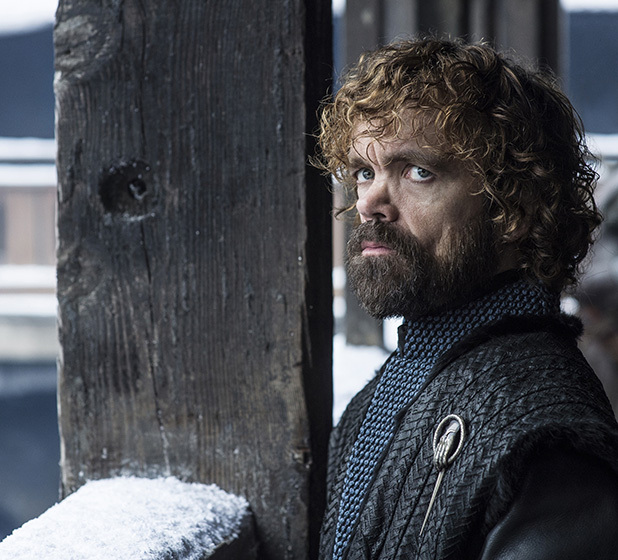 “A miserable affair,” says Tyrion. “It had its moments,” replies Sansa. (Honestly, Sansa has replaced Tyrion as the quip deliverer du jour of the show. I love it.) It’s an uncomfortable conversation, considering that wedding ended with Joffrey’s death and Sansa fleeing the scene, leaving her then husband (Tyrion) behind to clean up the mess. Despite this, you can see that Tyrion is impressed with Sansa’s survival and growth. Sansa, on the other hand, now sees Tyrion as a little disappointing, definitely not as intimidating as he once was. She thinks he’s a fool for believing Cersei will actually send her army. “I used to think you were the cleverest man alive,” she tells him before she walks away. Jon and Arya reunite under the Heart Tree. They hug fiercely. She shows him Needle. He asks if she’s ever used it. She responds vaguely, “Once or twice.” He, in turn, shows off Longclaw. He asks for her help with Sansa in getting her to cooperate with Dany. (“She thinks she’s smarter than everyone.” “She’s the smartest person I’ve ever met.”) Jon is amazed that Arya is defending Sansa, but Arya reminds him that she is defending their family and so is Sansa. She reminds him to remember that he is their family, too. Strickland leaves, and Euron makes his play for Cersei. She rebuffs him, saying, “You want a whore, you buy one. You want a queen, you earn her.” However, in a move straight out of the relatable modern woman’s playbook, she decides to sleep with him anyway. Post-coital Cersei is still pissed about not having the elephants. 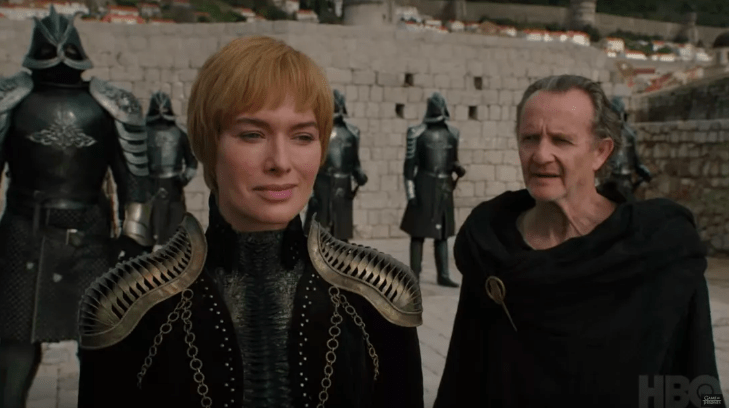 Cersei seems to enjoy Euron’s arrogance but sends him away after he promises to “put a prince in her belly.” She protectively covers her unborn baby. Davos welcomes the Karstarks to Winterfell. After, he takes Varys and Tyrion on a walk through the grounds. Davos reminds them that the North is loyal to Jon Snow, NOT Daenerys. The northerners and the Free Folk don’t know her or trust her. If she wants their loyalty, she has to earn it. While watching Jon and Dany flirt below, Davos proposes ensuring that Jon and Dany rule together if they actually survive the Night King. The three old men then sigh about being old. Jorah and Dany go to visit Samwell. She thanks him for saving Jorah from the greyscale. Unfortunately, she also informs him that she executed his father and brother, because they refused to bend the knee to her. He is devastated (even though his dad suuuuucked) but, also because he’s Sam, he remains very polite. Poor Sam. He runs into Bran on his way out. 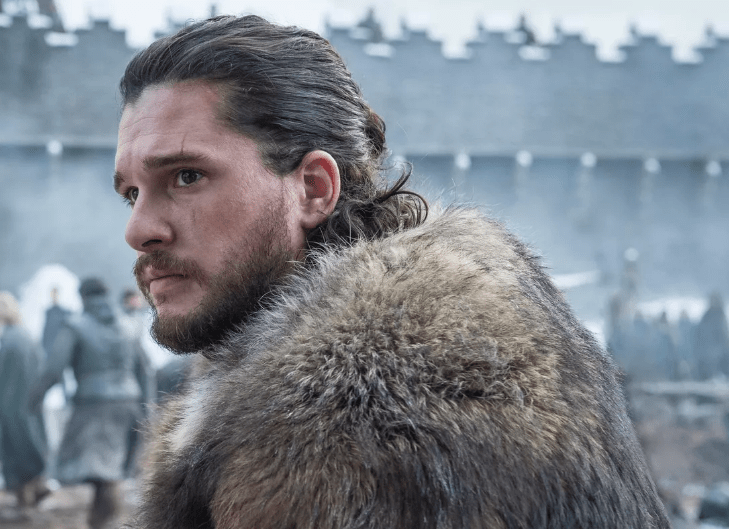 Bran tells him that it is time that they told Jon the truth about his parentage (and that Daenerys is his aunt) and that he is the true heir to the throne. Tormund Giantsbane, Beric, and crew have come to House Umber. It is dark and full of corpses. The army of the dead has passed through and slaughtered everyone, leaving the little Lord’s corpse pinned to a wall at the center of a spiral of severed limbs. Lord Umber’s corpse wakes up with blue eyes and makes to strike Tormund, but Beric stabs him with his flaming sword. The whole gruesome display goes up in flames. They make hasty plans to try and beat the Night King to Winterfell. Back at Winterfell, one reunion has yet to happen. Jamie Lannister has arrived, and Bran is waiting to greet him. They make eye contact as the scene cuts to black. Aaaaaawkward! Reunions have been made. Important truths have finally been told. The Night King is coming (oh lawd, he comin!). The final season of Game of Thrones is going to be as wild as a dragon ride! “Game of Thrones” Season 7 to Premiere on July 16!